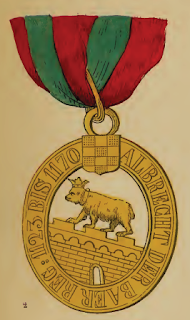 The Order common to the three Anhalt Duchies, is "Albert the Bear", founded by Prince Sigismund I about 1382, and renewed, on the 18th November, 1836, by the Dukes Henry, Leopold Frederick, and Alexander Charles, "in honour", as the patent says, "of their illustrious ancestors, and for the purpose of being presented as a token of honour and distinction to their meritorious subjects". The Order consists of three classes: Knights of the Grand Cross, Commanders, and (simple) Knights. The decoration of the Grand Cross (No. 2) is worn across the right shoulder, towards the left side, by a green watered ribbon with two poppy-coloured stripes, and is accompanied by a star (No. 1). The Commanders wear it round the neck, suspended by a similar but narrower ribbon (No. 3), while the Knights suspend it at the button-hole, by a ribbon of a like character, not so broad. In connection with the Order is a gold and silver Medal of Merit. The impression on it is the same as on the former, viz. : "Albert der Bar, reg. 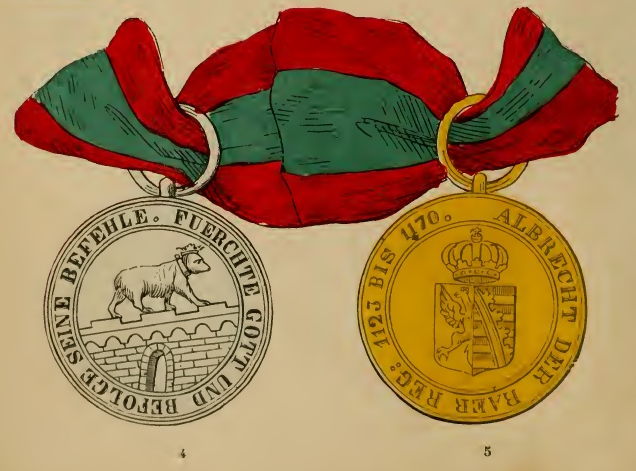 1123—1170", (Albert the Bear, reigned from 1123 to 1170), on the obverse; and "Fürchte Gott und scheue Niemand" (Fear God and no one besides), on the reverse. (Nos. 4 and 5). 1. 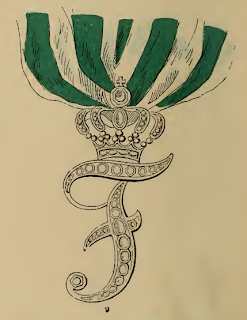 The Initial Decoration, founded by the late Duke Ferdinand. 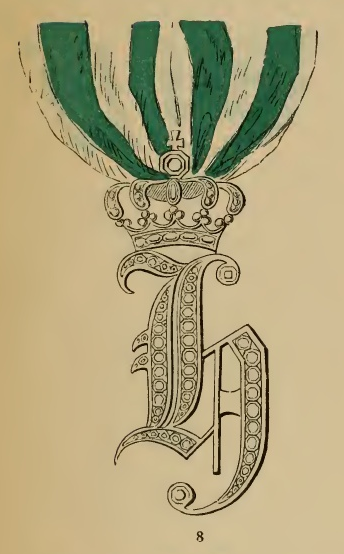 The initial was originally an "F", but, since the accession of Duke Henry in 1830, it has been changed into an "H". The decoration is set in brilliants, and is presented for long faithful service. It is worn round the neck, suspended by a ribbon of white and green colours ; and has only one class. 2. Medal of Merit, Loyalty and Attachment. (Nos. 8 and 9.) It was founded in 1835 by Duke Henry, and is divided into two classes : Gold and Silver. It is worn suspended by a white watered ribbon with a green stripe near each edge. 3. 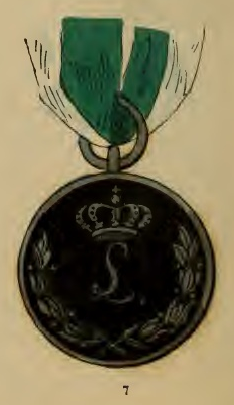 The War Medal for the campaigns of 1813, 1814, and 1815 (No. 10). It was founded in 1819, by Duke Ferdinand Frederick, and distributed amongst the troops who were engaged in one or all of the battles of those campaigns. 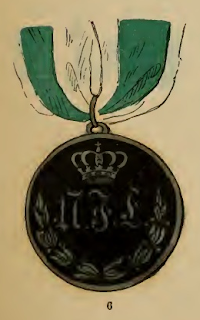 It is of iron, with the initial "L" (that of "Louis", the then reigning Duke) on the obverse ; and the legend, "Den Vaterland's Vertheidigern 1813, 1814 und 1815" (To the defenders of the Fatherland, 1813, 1814, and 1815) on the reverse. It is worn suspended by a white ribbon with four narrow green stripes (No. 7). 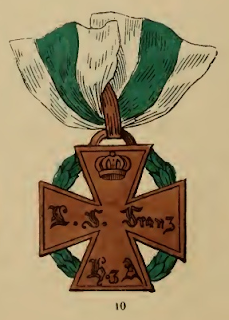 The Anhalt-Dessau branch possesses (besides the one common to all three) the "Cross of Volunteers for the campaigns of 1813, 1814 and 1815". (No. 10). 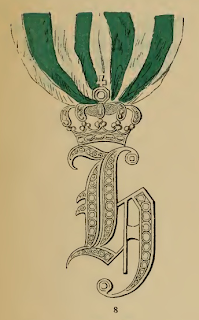 It was bestowed in 1823 by Duke Leopold Frederick on all those who already in possession of a mark of military distinction in the shape of a ribbon, founded and presented by his predecessor, Leopold Frederic Francis, in 1816. On the reverse is the inscription, "Anhalt's tapfern Kriegern, 1814—1815" (To Anhalt's brave warriors, 1814—1815). The third branch of the ducal house of Anhalt-Bernburg has also founded a War Medal for the campaigns of 1814 and 1815. It is of iron, with the initials of the Duke Alexius Frederic Christian on the obverse, and the inscription, "Den Vertheidigern des Vaterlandes, 1814—1815" (To the defenders of the Fatherland, 1814—1815) on the reverse. It is worn suspended by a green watered ribbon with two broad white stripes and edgings (No. 6). Suspended by a similar ribbon, is also worn a Golden Medal of Civil Service, the obverse of which is the same as that of No. 6. 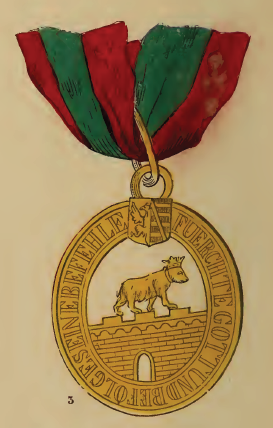 The inscription on the reverse marks the cause of the distinction, which is : "Für fünfzig-jahrige Diensttreue" (For fifty years' loyal service). To the above three classes of the Order "Albert the Bear", a fourth class was added, on the 24th February, 1850, at Dessau, the residence of the present oldest reigning Duke. It possesses a second class Commanders. All the four classes wear the insignia as given in Nos. 2 and 3, in addition to the old family escutcheon of the Behrings, viz. : on the obverse, a bear with a crown and collar placed upon a rising wall towards the left ; in the middle scutcheon are seen the Anhalt Arms, while the reverse exhibits below the eye or catch, the Ascanian Arms. The only distinction of the three classes consists in their different sizes. 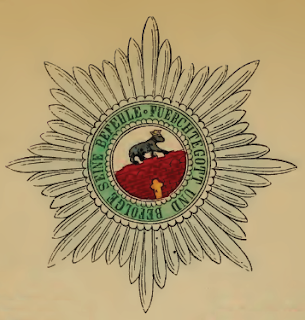 The Knights of the Grand Cross wear it across the right shoulder suspended by a broad ribbon of the colours given in the Table, accompanied by a star (No. 1) fastened to the left side of the breast. The Commanders of the 1st Class wear it round the neck, accompanied by a star, in the form of a cross, the rays of which are connected with each other by golden wreaths of rue, while the middle is the same as that of the star of the Grand Cross. The (simple) Knights wear it at the button-hole. The oldest member of the ducal family is Grand Master of the Order, but he consults the other Dukes on all important matters connected with the Order.